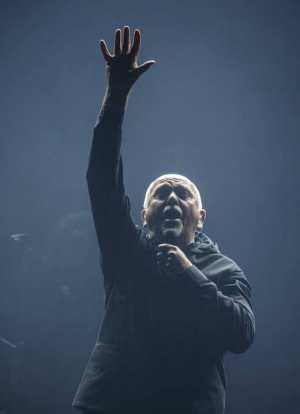 After decades in music, Peter Gabriel decided to give up what he dubbed “the traditional weapons of the rock armory” on New Blood, a collection of reworked solo songs released in October 2011. Rather than simply pasting on strings, he challenged himself to create without guitar, bass and drums. Working again with arranger John Metcalfe, who had earlier helped with a series of covers for Scratch My Back, Gabriel set about re-imagining his own music. Unlike with that earlier project, however, much of Gabriel’s solo catalog – “Intruder,” “Solsbury Hill,” “Red Rain,” “Digging in the Dirt,” “Signal to Noise,” even “In Your Eyes” – was initially defined by its rhythmic invention. It seemed large portions of New Blood, without the serpentine grooves and frisky cadences of their original forms, wouldn’t come easy. Still, Gabriel also memorably explored delicately wrought ballads like “Wallflower,” “Biko,” “Mercy Street” and, in particular, “San Jacinto” — a shattering meditation on the experience of Native Americans as their culture was ultimately subsumed. In those moments, New Blood found its early footing. “Wallflower” changes little, since it was originally a just-as-starkly played rebuttal to the way Latin American political prisoners were being treated in the ’80s. But Metcalfe gives “San Jacinto” an almost translucent new backing arrangement, transforming it into a vocal feature for Gabriel. When the tune makes its dramatic third-quarter turn (“I hold the line!”), Gabriel cries with knifing power. These successes provided momentum to dive more deeply into songs where this chamber-music adaptation would provide a steeper challenge. Not all of it worked. “Mercy Street,” missing the propulsive undercurrent of the original, lost something valuable in the telling. But by then it had become easier to see what drew Gabriel to this musical setting in the first place. Moments like “Intruder,” which always felt like the unused music for a particularly bloody scene in a slasher flick, somehow took on an even darker portent. “Digging in the Dirt” rumbled along with a brassy, avant-garde musculature. “In Your Eyes” was also borne anew in Metcalfe’s consistently understated new context, sounding more like a love song in the traditional sense of the word, but also more timeless: like a deeply expressed sentiment from any age. Even “Solsbury Hill,” which initially came off a reedy shadow of its former self, eventually – as with much of the offbeat, but deeply involving New Blood – thrived on its own terms.